Zorn Mold owners Ray Guess and Regina Coleman hold a plaque bearing the Blount County Commission’s resolution commending their selection as recipients of the Governor’s Trade Excellence Small Exporter of the Year Award. Known for innovative problem solving in manufacturing with high quality CNC (computer numerically controlled) machining operations, the company manufactures molds and parts, including fishing lure molds, blister pack molds, investment casting molds, Styrofoam molds, and general CNC machined parts – all exported to countries around the world (including Russia, with its representatives bearing gifts of vodka, Guess observed drolly). Four building projects, three having to do with repair or reconditioning, featured predominantly in the Blount County Commission’s April business meeting Monday. • Emergency mold remediation to improve air quality in the juvenile probation area of the Family Services Center, authorized in an emergency meeting March 29 at a cost of $12,000, accounted for the first stage of the emergency response to an air quality spot check. The test was prompted by reported chronic respiratory problems experienced by employees in the area. An additional $15,000 to replace ceiling tiles and make needed modifications to the heating/ ventilation/air conditioning system, accompanied by several months of air quality monitoring and followup crawl space de-watering checks constituted the second phase authorized Monday. • The commission approved an over-the-weekend emergency sewer line repair in the amount of $11,738 at the Blount County jail. The jail experienced a sewer line backup into the building itself recently. • The commission also authorized the chairman to engage Lathan and Associates, consulting architects, for recommendations on permanent replacement of the emergency sewer line repair, along with suggestions on qualified contractors to handle what could prove to be a difficult and complicated job. • In addition, the commission authorized Lathan and Associates to request bids on the construction of a metal building and associated plumbing and electrical work. The building is to be a minimum security facility to house selected inmates for a work release program recommended by a special jail task force last year. • Blount County Solid Waste Authority: Place 1 (four years) – Denny Armstrong; Place 3 (four years) – Jimmy Buckner; at large: (six years) – Paul Wilson. • Blount County-Oneonta Chamber of Commerce: District 1- John Reid; District 2 – Karen Gossett; District 3 – Kelly Stone; District 4 – Jay Tawbush (all one-year terms). • Blount County Water Authority: two four-year positions to fill. District 2 Commissioner Allen Armstrong’s motion nominating two candidates died from lack of a second; District 4 Commissioner Nick Washburn’s motion to postpone until the next business meeting died from lack of a second. No other action taken. • resolution commending Zorn Molds (see accompanying photo story). 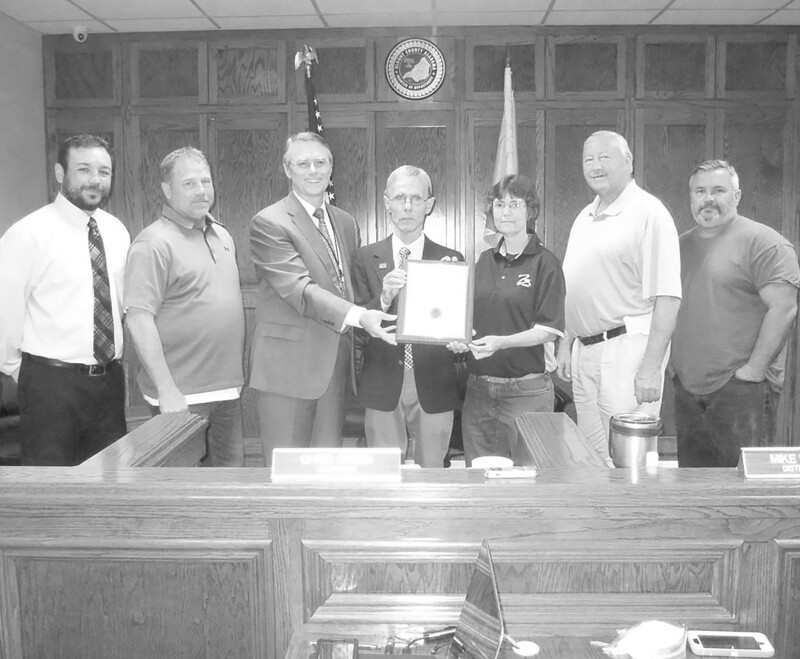 • resolution commending Shea Putman of J.B. Pennington softball team on her record-breaking seven home runs hit in seven consecutive at-bats; shattered both state record (three consecutive home runs) and national record (five consecutive home runs). • resolution commending Susan Moore High School power lifting team for winning 3A state championship and for highest overall points total in state, 1A through 7A. • resolution commending the Susan Moore Winterguard Teams for (1) winning a gold medal and title of Alabama State Champs by the varsity team, and (2) winning a silver medal in the novice division of the competition by the junior varsity team at the SRA Championships in Bowling Green, Ky., for the 2018-2019 season. • awarded the bid for on-call guardrail to the sole bidder, Alabama Guardrail. • approved renewing the tourism ad in the Blount County-Oneonta Chamber of Commerce’s Blount County road map for $1,595. • upgraded revenue department chief clerk job to grade 7, step 12. • named Jacki Goode as assistant county administrator and upgraded job to grade 7, step 9. • approved hiring a well-qualified heating/ventilation/air conditioning technician at a designated pay grade of grade 8, step 12 and compensation of $72,311, salary plus benefits. • approved budget amendments for Family Services Center, and Districts 1-4. •rescinded previous actions to purchase a new dump truck for District 2 while designating as surplus a 2018 Kenworth dump truck. • approved District 1’s 2019 paving schedule (see chart below).